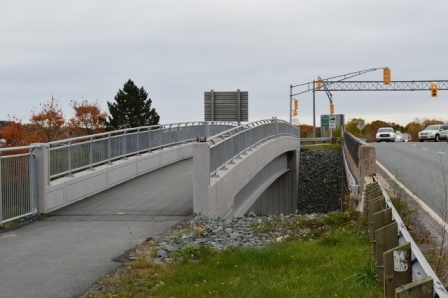 This 45 m single span steel plate girder pedestrian bridge was designed by HEC for HRM to provide safe pedestrian access across Highway 111 from Highfield Park to the Burnside Industrial Park. Located adjacent to the existing Burnside Drive underpass structure, the new pedestrian bridge span allows for a future widening of Highway 111, below, from the current four lanes to a future six lanes of traffic. The 3.0 m (clear) wide pedestrian structure consists of two steel plate girders, a composite concrete deck and fully-integral abutments founded on 200 mm diameter micro-piles socketed 5.0 m into the underlying bedrock. The design allowed for not only the construction of the new abutments without the need for expensive temporary shoring of the existing Burnside Drive underpass abutments, but also for the future removal and replacement of the existing underpass structure without the need for temporary shoring of the pedestrian bridge. Cost effective aesthetic features were also considered in the design, including decorative reveals on the abutments, crash blocks and pilasters, the allowance for future lighting on the structure, the use of textured concrete, and galvanized steel railings with an industrial style to blend with the adjacent Burnside Industrial Park. 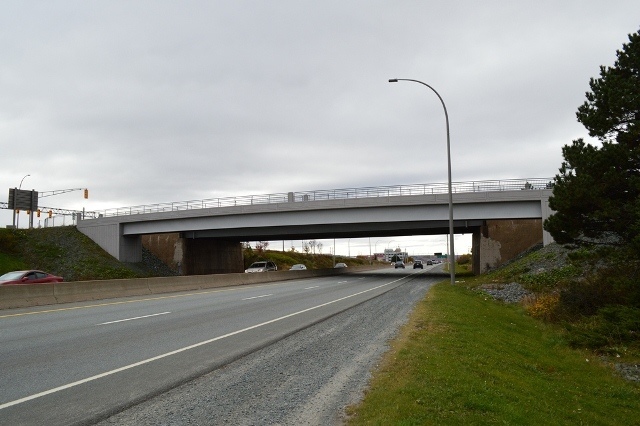 To mitigate traffic disruptions along Highway 111 during construction, the design considered casting the portion of deck over the Highway at the steel fabrication yard and erecting the combined girders and deck onto the abutments during low traffic volumes on a Sunday morning. 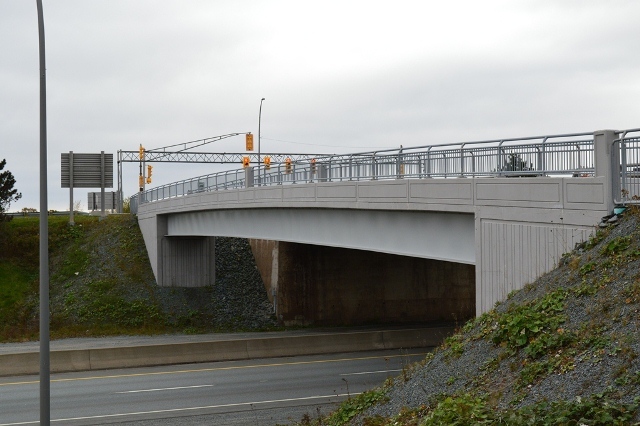 The erection method reduced closure of Highway 111 to less than three hours and eliminated the need for suspended deck formwork above the Highway.